This post is placed in two categories; setting it in ‘Tales of Toadstools’ and ‘Woodland Treats’ due to its mixed acceptance in edibility, so it may not be much of a ‘woodland treat’ for everyone out there. It’s one of those ‘they’re everywhere’ mushrooms in autumn, definitely around Leicestershire anyway. 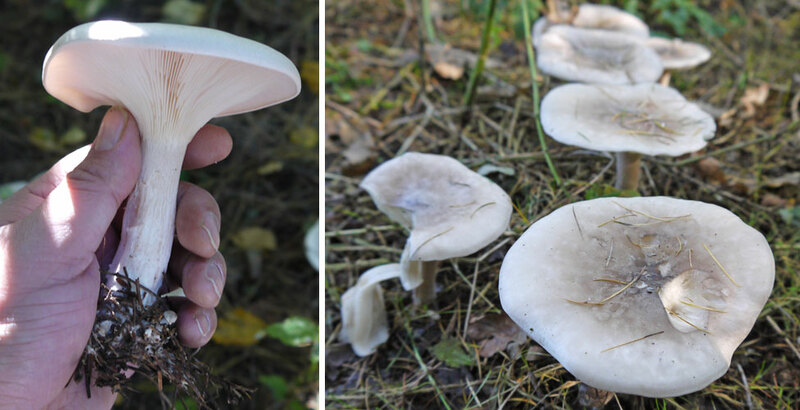 Their appearance can be really quite dull, but depending on their age, the Clouded Agaric (Clitocybe nebularis) can vary in medium to very large in size (up to 20cm) and often grow in huge rings or groups in deciduous or conifer woodland. They’ve always have a place in my heart because they were my first mushroom hunting discovery and ID case. Just shows how ‘common as muck’ they are! Very common that is, from late summer to late autumn. The common name comes from the appearnce of the cloudy white/grey coloured cap (sometimes with a hint of light brown) which is always darker at the centre. The shape of the cap is initially domed, then flattened and later with a depressed centre. The margin can be smooth and round or even wavy and irregular. The whitish stem is often quite tall with a thick bulbous base, covered in fine white mycelium where woodland floor debris likes to cling to. Being one of the Clitocybe genus (Funnels) the crowded whitish gills are always decurrent, that is, running down the stem, sometimes only slightly so. Edibility-wise, they are recommended to be avoided, which I’m having a problem with. It seems such a waste. They’re large, juicy looking with loads of them about. The main reason being is that they can ‘disagree’ with some people and cause some bad stomach upset. Somebody must have tried to eat them, and what do they taste like? Was it worth it? So, come Autumn again this year, I think I’ll have a taster and see if I’m OK with it. Because if I am, then wow, I’ll be spoilt for pickings. Here’s hoping! The cloudy whiet/grey agaric often grows in rings or large groups in woodland. 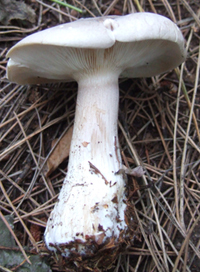 They are often quite large (15 – 20 cm diametre cap). Note the decurrent gills (left). 8 – 20cm White/Grey sometimes with light brown hue. Initially convex, matures to flat and dip in centre. Inrolled margin. Margin sometimes wavy & irregular. Flesh is thick & white with strong sweetish smell. 5 – 12cm x 2 – 3 cm. Paler than cap. Swollen, thicker base. Woodland floor debris sticks to white mycellium at base. Becomes hollow and breaks easily. White, crowded & decurrent. When older the colour has a yellowish hue. Spore Print: Cream (see how to take a spore print here). In deciduous and coniferous woodland on the floor amongst leaf and needle litter. In large groups or rings. Late summer – late autumn. Very common. Edible. OK. May cause gastric upset. Cook a little first and test. • Caps are often ‘funnel’ shaped; sometimes with a central bump (umbo). • Gills are decurrent; sometimes very deep down the stem. • Possess strong; often distinctive smells such meal (fresh flour/grain or slightly cucumber-like) or aniseed. Update (September 2010): Autumn came around again pretty sharpish and I harvested a few of these beauties. After I fried and tasted a small sample, I waited a good 12 – 24 hours and I was fine. No gastric upset (as this is all this mushroom can do at it’s worst!). My God, what a lovely flavour. I consider this to be the ‘poor mans’ Field Mushroom’ – it’s not as splendid in overall flavour and consistency, but by golly, it’s damn close. I tucked into a few with my usual Saturday morning fry-up. They are really nice. I shouldn’t be telling you this because you may get out there and harvest my crop! But seriously – well worth a go, and if you find a good patch in a wood in a ring – you will be spoilt senseless. Just cut open the stem to check for any maggot infestation – unfortunately they love it also! See my latest pictures below. Some are younger and perfectly formed. As they grow older they get a ‘wavy’ margin (edge of cap).